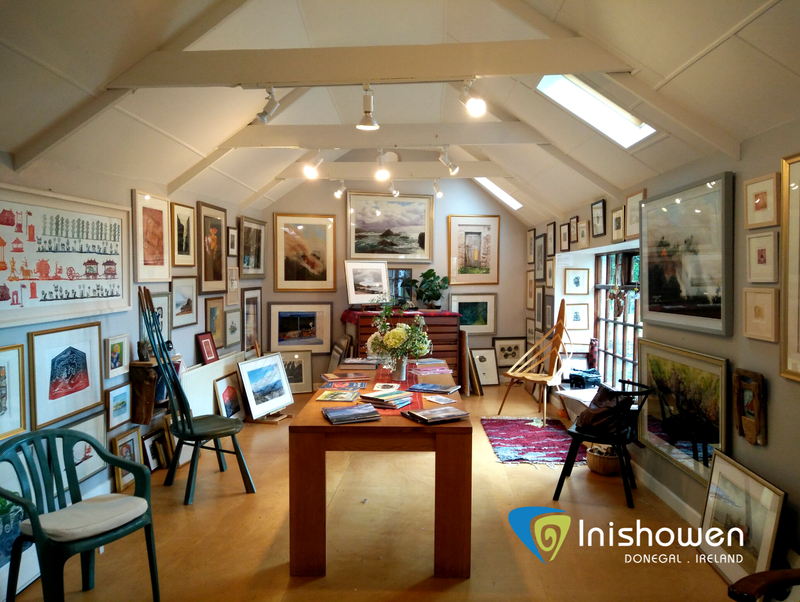 Today's trip takes me back to the creative and picturesque Ballagh Studio in Inishowen, to meet Tim Stampton, Artist, Illustrator and Print Maker. The studio, pictured above, houses creative pieces by both Tim and fellow artist, Ros Harvey. Tim Stampton, was born in the UK and later moved at a young age with his family to Canada. His early career involved work in the printing industry and lithography. Tim, studied at the Canterbury College of Art and spent a number of years at Leach Pottery in St. Ives, England. At St Ives, he received training by and later worked alongside Bernard Leach, who is considered the Father of British Studio Pottery. With this in mind Tim would become an acclaimed potter, setting up his own ceramics studio in Nova Scotia, Canada and teaching in universities in both Canada and England. 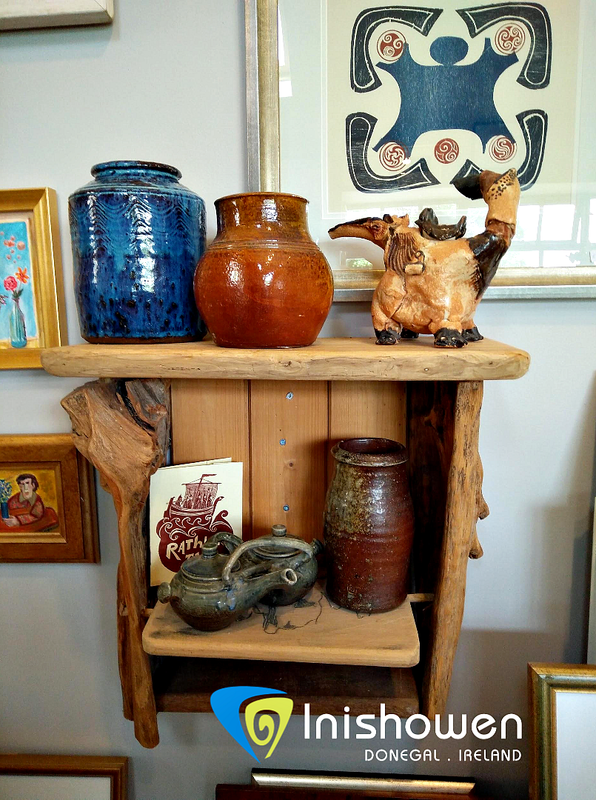 At the studio you can view examples of the range of pottery he has crafted over the years from brown earthenware pottery, made in Canada to wood fired stoneware pictured above. Tim explains that the medium used e.g. the type of clay and how it is fired (electric, gas or wood kiln) effects the type of finish you will see and feel on each pottery piece. 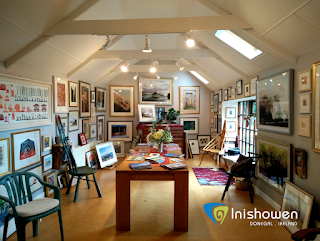 Moving to Ireland in 1988, Tim set up his own print workshop, illustrated in the video above, at Ballagh. At Ballagh, he moved away from pottery and focused his energies on producing wood cuts and prints. Tim kindly invited me to his workshop to gain a better understanding of how he creates his prints. 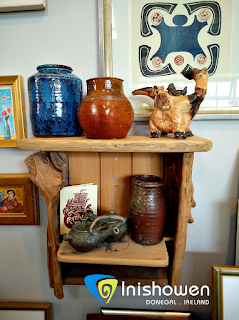 Entering Tim's workshop you will notice an abundance of creative sketches, prints, books, and equipment. In viewing his work you will see that Tim is inspired by local myth, folklore and legends.Tim uses traditional methods of printing to incorporate these mythical tales and images into his work. The Lithographic press, pictured above, was rescued by Tim from an art college in the UK, partially restored and as you will see is now frequently used. Lithography is a term used to describe the process of printing from a flat surface that is treated to repel the ink, except where it is required for printing. In the following video Tim introduces the press and provides a demonstration of how to use it. Within the workshop there is a host of other traditional printing equipment. Each piece of equipment has been carefully restored and has different applications, which create the unique variety of work you will see in the studio. Stay posted for my next piece of traditional printing techniques used by Tim in his workshop. Ballagh Studio is open Mon-Sun 9-6. After hour visits are by appointment. Flyers Printing This is the fantastic impressive place. I'm pretty much thrilled with your good function. You put really beneficial information. Keep the idea up. Keep threading. Seeking to reading your future post. howdy, your sites are decent. I value your work.